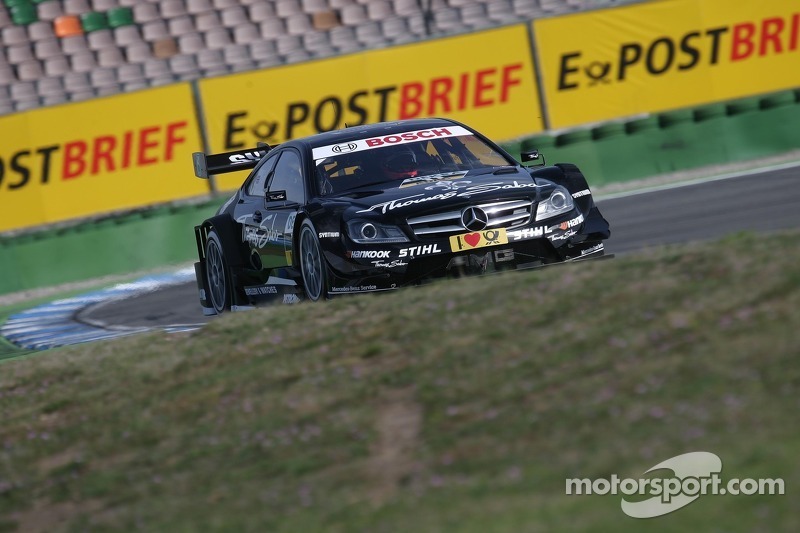 Round one of the German Touringcar Masters (DTM) was surprisingly won by Briton Gary Paffett for Mercedes Team HWA. Enough reasons for Mercedes chief Norbert Haug to be happy, as three of his cars ended up in the top five this afternoon, Jamie Green (HWA Mercedes) finished in second place, while Christian Vietoris (HWA Mercedes) took fourth place. The man who started the race from pole position, Mattias Ekstrom (Audi Sport Team Abt Sportsline) crossed the finish line in third position; Mike Rockenfeller took fifth place after he had lost his fourth place to a charging Vietoris during the closing stages of the race. 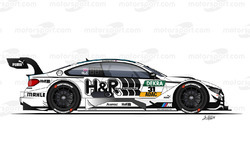 The first five laps of the race were somewhat chaotic, at the start all eyes were on Dirk Werner (BMW Team Schnitzer) but the 31-year old DTM debutant got away very slow from his start position and fell back to seventh place. There was of course the usual melee on the first corner, Timo Scheider (Audi Sport Team Abt Sportsline) was hit by Ralf Schumacher (HWA Mercedes) which did a lot of damage to his brand new Audi, he had to pit for repairs and fell back to last position. At the same time Werner took sixth place back from his marque colleague Andy Priaulx (BMW Team RBM), but just before the end of the first lap Priaulx took it back again. Lap two was the scene of more confusion, Schumacher braked too late for the hairpin, the Spitzkehre, hit Werner, who in his turn hit Bruno Spengler (BMW Team Schnitzer). Schumacher was awarded a drive through penalty for his actions. 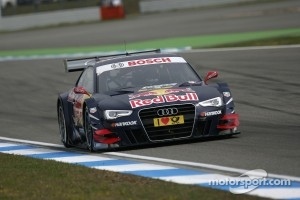 As a result, Spengler had a lot of damage, to make things worse he lost his engine cover as well and was forced to pit. When he stopped at his garage it became apparent the damage could not be fixed and the Canadian had to give up his first race for BMW without even completing one lap. Rookie Adrian Tambay (Audi Sport Team Abt) had also been involved in the incident and also lost his engine cover, and he had to give up his race after just three laps. Werner also had to pit for repairs and sadly for him he rejoined the race in 18th position and lost all chances on a points scoring position. Meanwhile Ekstrom was also in trouble, he missed his braking point at Turn 2 and Green flew past the Swede, next was Paffett who overtook the Audi as well at the exit of the Spitzkehre. 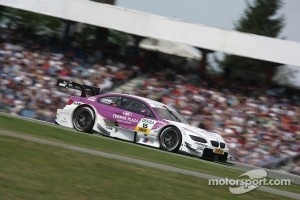 On lap four 2011 DTM Champion Martin Tomczyk had to retire, also with damage to his car sustained during the first lap. Thus after ten laps Green was leading, followed by Paffett, Ekstrom, Edoardo Mortara (Audi Sport Team Rosberg), Mike Rockenfeller (Audi Sport Team Phoenix Racing) and was the fastest BMW driver in sixth position. From lap 11 on it was time for the first of two mandatory pit stops, Priaulx was the first to stop, but he was soon followed by the rest of the pack. Scheider also pitted but he decided to give up the race as his car had sustained too much damage during the incident with Schumacher. Paffett had already challenged Green for the lead, but it became really interesting when Paffett pitted and exited the pit lane and ended up alongside Green, and the Mercedes duo was heading side-by-side for a showdown right at the Spitzkehre. Paffett was in the better position on the inside of the corner, also braked later and sneaked past Green. The latter tried to get a tow from Paffett again at the exit of the hairpin but Paffett was just too fast for him. With 19 laps on the board now, it was time for the second round of pit stops, which became a Waterloo for Augusto Farfus (BMW Team RBM), he missed his pit box when he came in, put his foot down on the accelerator when he realized his mistake and exited the pit lane again. Next lap he pitted again, and this time did not miss his pit box but went out too fast and was awarded a drive-through penalty for speeding in the pit lane, it was obviously not a good day for the Brazilian who due to his mishaps ultimately finished in 15th place. On track Miguel Molina (Audi Sport Team Phoenix Racing) was challenging David Coulthard (Mercedes Mucke Motorsport) after the Scot had missed his breaking point at the Spitzkehre, the Scot insisted on keeping his eighth position, gave the Audi a friendly whack and the duo went on to finish the race in eighth and ninth position respectively. 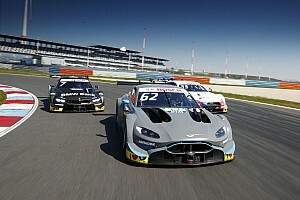 All but the top-three had pitted two times, and because Green had been closing in on Paffett, their last stop could decide the outcome of the race. 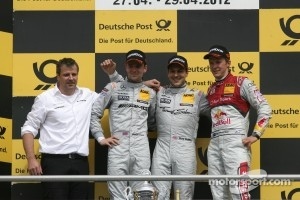 Paffett stormed into the pit lane first, made a fast and flawless stop and rejoined the race in second position. Next lap it was Green’s turn, he pitted but rejoined the race still behind Paffett. 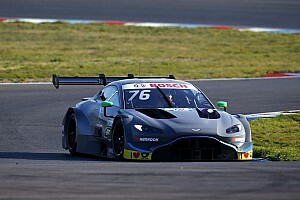 At least Green didn’t have to worry to be caught by Ekstrom, who was almost 18 seconds behind the Briton after he had made the last pit stop of the day at the Hockenheim circuit. Green on fresh tyres was during the closing stages of the race faster than Paffett, but the gap was a little over three seconds and Green in fact started his charge too late as he only had ten laps to catch Paffett. Just a few laps later Green gave up and settled for second place. Behind the two Mercedes drivers was still Ekstrom, and he was followed by Rockenfeller and Vietoris in the Mercedes. The Italian wanted fourth place from the German, but Rockenfeller time after time defended his racing line, and again at the Spitzkehre, Vietoris tried to take over fourth place. His Mercedes was fast and stable under breaking but Rockenfeller again defended his line, but now Vietoris was just three-tenths of a second behind the Audi and on lap 35 Vietoris finally overtook Rockenfeller on pure speed. Rockenfeller, now fifth, had soon Priaulx in his mirrors, the Briton tried hard but again his efforts were of the category ‘too little too late’ and he could not catch the Audi before the chequered flag was waved. 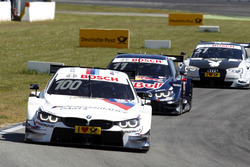 And thus ended the first round of the DTM series, Paffett won and was followed by Green, Ekstrom, Vietoris, Rockenfeller, Priaulx, Schumacher, Coulthard, Molina and Filipe Albuquerque (Audi Sport Team Rosberg) completed the top ten. The still angry Mortara steered his damaged Audi to 11th place. Susie Wolff (Mercedes Persson Motorsport) finished in an excellent 12th position, while rookies Hand, Robert Wickens (Mercedes Mucke Motorsport) and Farfus finished in 13th to 15th position. 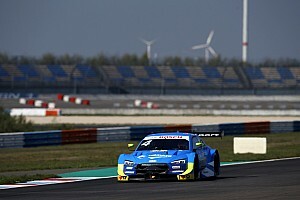 Rahel Frey (Audi Sport Team Abt) was 16th, while Werner who had started from a promising third place of the grid finished in 17th spot. And finally Roberto Merhi (Mercedes Persson Motorsport) had to retire just two laps shy of the finish line. 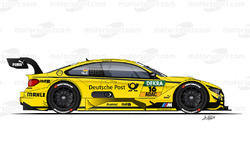 The next race is already next weekend at the Lauzitzring, Germany, where again 22 drivers will appear at the start of another thrilling episode of the 2012 DTM Championship.